I cleaned my closet! It’s not 100% organized, but at least you can open and close the door. I have more craft projects this weekend, so I’ll be in there later today getting the bins straightened out. Fritz is camping with the Boy Scouts this weekend. Separately, Bill and Billy are camping with the Cub Scouts as well. They will take our 6 person tent. A few years ago, the tent poles were left behind after a camping trip. We went back, but they were gone. We hoped that someone from the group (it was another Scout camp) had picked them up and would put out an email asking who had lost their poles, but it didn’t happen. Apparently, this isn’t such an uncommon experience, because LL Bean sells replacement poles. Replacement poles are much cheaper than a new tent. Unfortunately, the new poles did not come with a carrying bag like the original poles had. Perhaps bags are also sold, but we didn’t go back and check. We’ve just grumbled about it for years. Of course, we don’t think about it except when we go camping. Like this weekend. Have I ever mentioned that I have a lot of old Army uniforms? Or that I like to recycle them? Or that I like to recycle any fabric whenever possible? The blouses (the tops) have a big portion of fabric that is useful, but the pants are not as easy to use because there are so many seams. I have made some bags for boys (“man-purses”) which have been very popular (in fact, the kids need some bags to hold piano music and I think I’ll use the pants if they are wide enough…one more project on my to-do list). It even has room at the bottom to store the rubber mallet my husband uses to put the plastic tent pegs in. I have at least a dozen pairs of pants in my closet. If you need a bag for your tent poles, let me know. I didn’t put on a carrying strap, because I didn’t think it was really necessary (car to tent site being generally less than 10 yards), but I could add one later if I change my mind. That's a fantastic idea. I used some of Gary's shirts to make a quilt, but the pants really don't have large areas to cut up. I'm loving all your ideas in this arena. 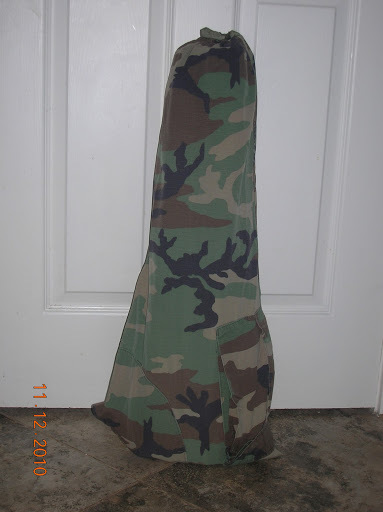 Not sure if you're a soccer mom or not, but you could probably use the pant legs as chair bags, as well. Those flimsy bags the folding chairs come with simply don't last. Very cool! Are you sure he uses the rubber mallot just for the stakes? and i just realized i spelled genius wrong… no one ever said I was a genius! haha. Bookmarking this one! It is exactly what I need to store the PVC fort-making supplies I'm assembling for the kids! Lee, I wish I had your email address. I didn't know your husband was deployed. Glad you are surviving. Take care. We'll be back in NOVA sooner or later.